On Christmas Eve (24.12.) and New Year's Eve (31.12.) the Kunsthalle Mannheim is closed. On Christmas Day (25.12.2018) and New Year's Day (01.01.2019) the regular public holiday opening hours from 10 a.m. to 6 p.m. apply. On the day after Christmas (26.12.2018) the Kunsthalle Mannheim is open from 10 a.m. to 8 p.m. The Kunsthalle Mannheim is located just off the Friedrichsplatz, in the center of Mannheim, and is easiy reached by all modes of transport (plane, train, bus, public transport, car). There is an underground parking garage available below the Friedrichsplatz for visitors arriving by car (“Kunsthalle”). The museum is a 7-minute walk from the train station. Visitors can also take advantage of car-sharing or rental bikes. You can reach the museum via the following highways: A5, A6, A61, A65, and A67. Follow the signs for the museum and for parking. From Mannheim there are direct high-speed train connections to Basel, Berlin, Cologne, Düsseldorf, Frankfurt, Frankfurt airport, Freiburg, Hamburg, Munich, Paris, Stuttgart, and many other cities. Intercity buses run regularly between Mannheim and numerous cities all across Germany. The bus station is located directly beside the Mannheim train station. Frankfurt airport: direct high-speed train connection to Mannheim main station (ca. 30 minutes). The Kunsthalle Mannheim cannot reserve parking for tour buses. Bus parking is available at Friedrichsplatz 1, Theodor-Heuss-Anlage, and buses may also park in Heinrich-von-Stephan-Straße beside the main station. Buses may stop temporarily in the bus bay in Roonstraße to allow visitors to disembark. The Kunsthalle Mannheim is almost completely accessible for visitors with reduced mobility and visitors with strollers. Strollers, manual wheelchairs, and electric wheelchairs suitable for indoor use may be used in our exhibition spaces. Wheelchairs can be provided free of charge (please contact us in advance to reserve). We reserve the right to restrict the use of strollers for security reasons, for example when the museum is particularly busy. In the close vicinity of the Kunsthalle Mannheim you find five parking bays for disabled people in the parking garage "Kunsthalle" (underneath the Wasserturm), a disabled parking bay in the Tattersallstraße / corner Friedrichsplatz and one in the Motkestraße / corner Tattersallstraße. The Kunsthalle Mannheim offers a range of public tours and events on many different topics. Children’s program “Peephole Art” (90 minutes): €5 per child incl. admission fee. Number of participants for tours is limited to 25 people per group; parallel group tours can also be arranged. The Kunsthalle Mannheim allows self-guided tours for adult groups following registration and advance booking for a price of €25 per tour. The number of participants is limited to 25 people per group. Several licensed tours in parallel can also be arranged. The mission statement of the Kunsthalle comes to life in ProgrammPlus: “Art for all.” Our goal is to create an inspiring atmosphere, enabling people to find a new way to examine contemporary questions and ideas through art. Art becomes relevant to our everyday lives and our inner life! ProgrammPlus brings the questions and issues that determine the nature of our existence into focus with educational and recreational events, concerts, performances, and publications, placing itself between discourse and urbanized society. We are delighted to answer your questions and hear your suggestions. Please contact our visitor service. The visitor service is open Monday – Friday between 9 am – 12 pm and 1 pm – 3 pm. You can download our free Kunsthalle Mannheim app using our free WiFi, which gives you internet access in all the Kunsthalle Mannheim buildings. Connect your phone or tablet to the Kunsthalle WiFi to use our Kunsthalle Mannheim App and our other digital tools. The Kunsthalle Mannheim accepts no liability for use of the internet via the Kunsthalle WiFi. Would you like to receive regular information about our exhibitions, program, events and digital services? Register for our newsletter and we will keep you informed. The museum shop offers a carefully selected range of products and books related to art, architecture, photography, design, and much more. Alongside multilingual publications for the young and old, ranging from exquisite coffee table volumes to creative coloring books, visitors will also find stationery, jewelry, fashion, and other everyday items. Did you marvel at the green dress in the painting by Ferdinand Hodler? Look no further! You can take the actual dress home with you, or challenge yourself and buy the pattern and the fabric, all available in the museum shop. The museum shop has the same opening times as the museum. LUXX restaurant has a lot to offer museum visitors. Breakfast, lunch, coffee, and an afternoon selection of cakes are available, before fine dining commences in the evening. A whistle-stop tour of Africa, a quick sojourn in the Pacific, or even just a trip to nearby Palatinate: LUXX is a new site for meetings in the heart of Mannheim, where culture and pleasure come together. DJ sets and live music performances are also held on Friday and Saturday evenings. 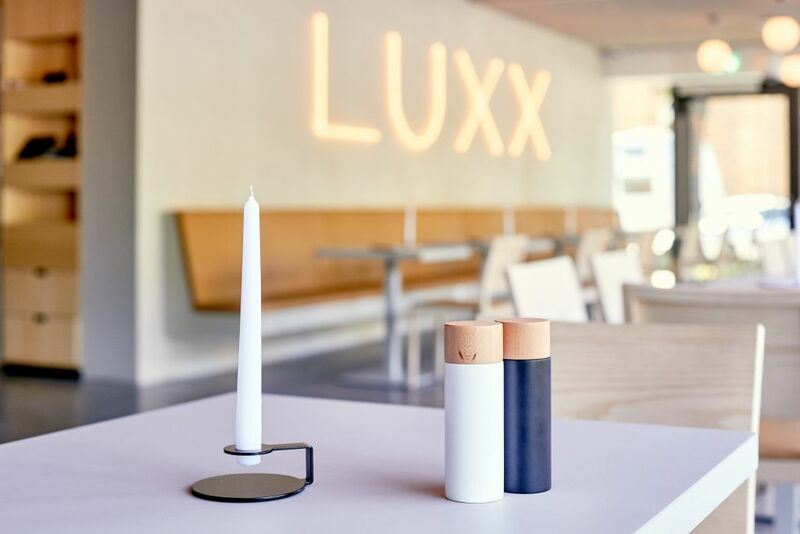 The name comes from the Latin word “lux,” which means “light.” The second “X” stands for the unusual character of this museum restaurant. The drawing robot Walluxx responds to guests’ input, producing a communal mural each day. A real surprise! Whether you are organizing a company celebration, an anniversary, a reception or a conference, the Kunsthalle Mannheim has many spaces to offer which are ideal for events and are available to rent. Audio guides for adults and children are available for our collection and for special exhibitions, and devices can be borrowed from the atrium for €3. The audio guide can also be downloaded free of charge using our Kunsthalle Mannheim app. The Kunsthalle Mannheim is almost completed accessible for visitors with reduced mobility. Manual wheelchairs and electric wheelchairs suitable for indoor use may be used all of our exhibition spaces. Wheelchairs can be provided free of charge (please contact us in advance to reserve). 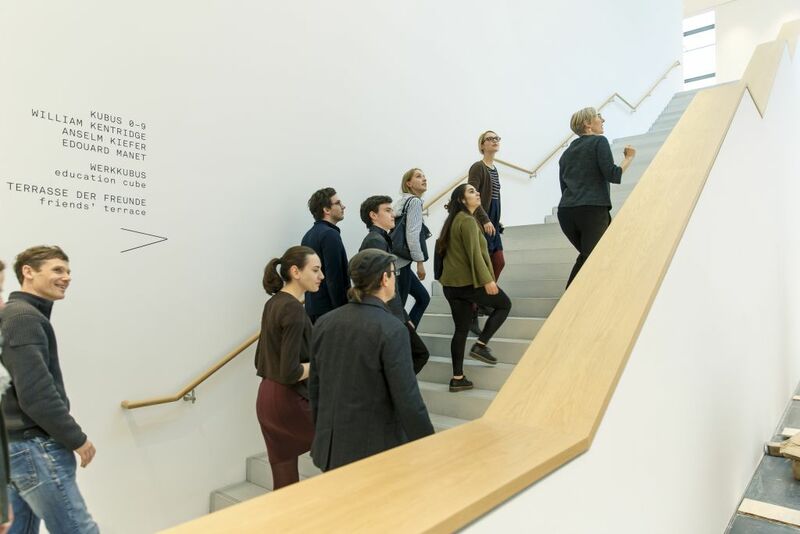 If you would like to book a guided tour or register for one of our events, please contact our visitor service Monday – Friday between 9 am – 12 pm and 1 pm – 3 pm at +49 621 293 6423 or at besucherservice@kuma.art. Recipients of unemployment benefits type II (Arbeitslosengeldes II). 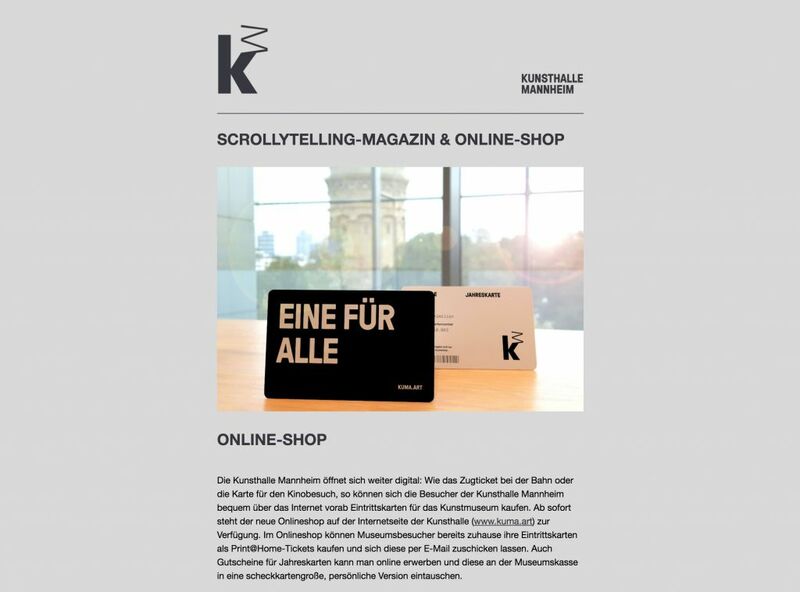 For many years, the Kunsthalle Mannheim has succesfully collaborated a number of businesses. The Kunsthalle’s interest in working closely with current themes and their innovative exhibitions and programs plays an important role. Exploring and debating current themes and viewpoints creates an inclusive atmosphere in the development of art, culture and society. There is a long history of civic engagement at the Kunsthalle Mannheim, which it has depended on ever since it was founded by director Fritz Wichert. Without the support of the people of Mannheim, his ground-breaking acquisition of Manet’s “The Execution of Emperor Maximilian of Mexico” in 1910 would have never been possible, for example. Today, the Kunsthalle Mannheim relies on various kinds of help from individuals and businesses alike. With the help of support from the Friends of the Kunsthalle Mannheim, the museum can continue to work on the preservation and development of its collection: Since the Friends were founded in 1977, the purchase of over 110 artworks and 150 objects for the ceramics collection has been made possible, which the Kunsthalle Association have made available for loan. Another opportunity to get involved is the “adopt a painting” project run by the Friends. The Kunsthalle Mannheim Foundation, in conjunction with the Benefactors’ Circle (founded in 2017), helps the Kunsthalle to realize special exhibitions and promote research and publication projects. This additional support makes it possible to realize fantastic exhibitions, acquisitions, special institutional responsibilities, and important research and publication projects. If you would like to support the Kunsthalle Mannheim, you can find more information about how to get involved here. Please do not hesitate to approach us if you would like more information, if you would like to suggest a partnership or if you have any further questions. We look forward to hearing from you! Food and drink and other liquids are not permitted in the exhibition spaces. The cloakroom is at your disposal to store these items for the duration of your visit. Rooms are available on the first floor for feeding babies and children. Families with up to two adults and their children (under 18) can purchase a family ticket for €16 at the ticket office. Taking photographs (without flash) using the KuMa app for private purposes is permitted in the collection. Photography is prohibited in the special exhibitions. Commercial or editorial photography, videos and audio recordings requires written permission from the Kunsthalle Mannheim. Please contact our press representative prior to your visit at presse@kuma.art. Commercial use of photographs and recordings is prohibited without prior permission, as is the use of additional lighting (flash, video lights) and tripods. Photography with a tripod or with a selfie stick is not permitted. Visitors can leave items of clothing at our cloakroom during the opening hours of the museum. Larger bags, backpacks, umbrellas, child carriers and walking sticks must be left at the cloakroom with the exception of walking sticks needed for medical reasons. Only limited space is available for the storage of suitcases. The Kunsthalle Mannheim assumes no liability for items left in the cloakroom or the lockers provided. LUXX is a new venue at the heart of Mannheim, where culture and pleasure meet. DJ sets and live music performances are held on Friday and Saturday evenings. Registration: we request that registration is completed 14 days in advance by phone on + 49 621 293 6445 or email kunstvermittlung@kuma.art. You can find the house rules of the Kunsthalle Mannheim here. As an ICOM member, you have free entry to the museum. Please request a free ticket at the ticket office with your ICOM ID. The Kunsthalle Mannheim is almost completely accessible for visitors with strollers. Strollers may be used in all of our exhibition spaces. We reserve the right to restrict the use of strollers for security reasons, for example when the museum is particularly busy. Online tickets are available at the ticket shop and can be used to visit the museum. Online tickets must be printed. Unfortunately returning or exchanging online tickets is not possible. Our online shop can also be accessed using tablets and smartphones. Concession tickets are only valid with the corresponding ID. Press information and photos of the Kunsthalle Mannheim and all upcoming exhibitions is available to download at presse.kuma.art. The use of the material for the purposes of media coverage is free of charge. Seating is available throughout the museum. Folding chairs are also available that can be taken into exhibition spaces in the permanent collection. Please note that the use of folding chairs is not permitted in special exhibitions for security reasons. Pets are not permitted in the museum, with the exception of official guide dogs. Toilets are located on the first floor of the new building and in the basement of the art nouveau building. The toilets are only open to museum visitors. Baby-changing facilities can be found in the disabled toilet on the first floor of the new building and in the basement of the art nouveau building. Trams 3, 4, 5 and 6 to the “Kunsthalle” stop. Buses 60 and 63 to the “Kunsthalle” stop. The museum is a 7-minute walk from the train station. 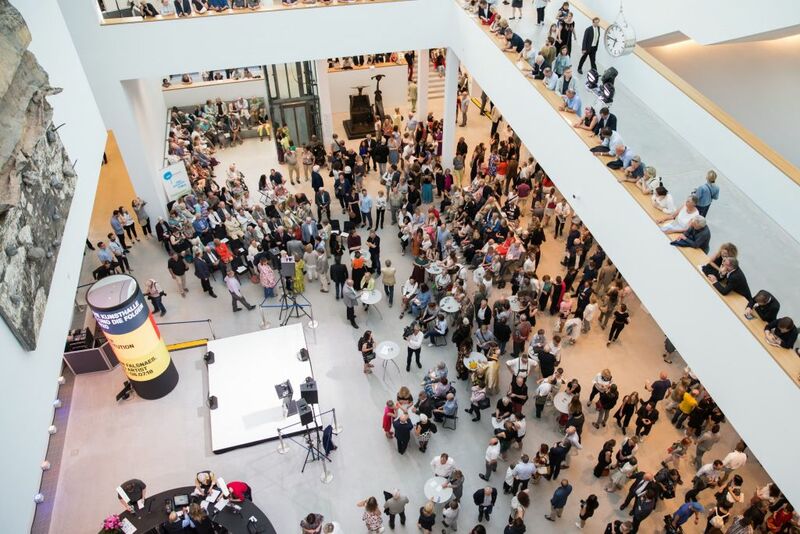 Become a part of the tradition of civic engagement in the Kunsthalle Mannheim and donate now!